Special Containment Procedures: SCP-2649 must be contained within a standard animal containment chamber, and is to be provided with at least four ounces of raw meat, of any type, per day. This feeding schedule must be randomized weekly in order to minimize chances of an attempted escape by SCP-2649. Any containment chamber housing SCP-2649 must be lined entirely with ceramic tile or some other ceramic surface. Any personnel interacting with SCP-2649 are to wear boots that have been equipped with ceramic soles. 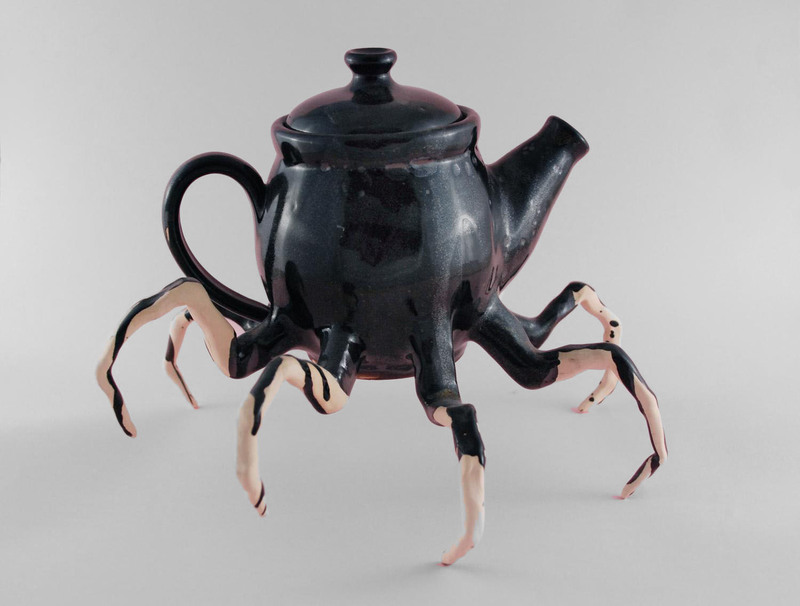 Description: SCP-2649 resembles a white teapot with four pairs of mobile arachnoid legs attached at its base. The mechanism by which these legs are capable of movement is unknown, as the entity appears to be composed entirely of ceramic. The "spout" produces a highly viscous black liquid, hereafter referred to as SCP-2649-A. The entity has been observed bending over to "pour" this fluid on the ground around it, and it is capable of reabsorbing the substance as needed. Any such pool of SCP-2649-A functions as a portal - any object crossing the surface is transported to a pocket dimension in which organic matter deteriorates over time. Objects larger than the surface of an SCP-2649-A pool are not affected. No objects transported in this manner have been recovered, but radio transmissions can be received, suggesting that the portal functions in both directions. Because SCP-2649 has been observed moving any provided food into a layer of this liquid, it is believed that the pocket dimension accessed via SCP-2649-A serves as the entity's means of digestion. SCP-2649 itself cannot be transported by this fluid, and has even been known to coat itself with it as a means of defense - transporting any projectiles and small threats that make contact. Experimentation suggests that this resistance is linked not to the identity of SCP-2649, but to its material; experimentation confirms that objects composed of ceramics will not pass through a layer of SCP-2649-A. Objective: Collect data regarding the SCP-2649 pocket dimension. Procedure: A 500g mass of raw beef is lowered into a sample of SCP-2649-A, followed by a camera that can be accessed remotely. Results: The camera view displays a dark expanse, with no walls or boundaries visible. Several inanimate objects are adrift, as gravity appears to be absent. All of these objects are composed of metallic or mineral substances - none are organic - and they range in size from coins and tooth fillings to metal chairs and a single six-foot I-beam. No light sources exist other than that mounted to the camera. The beef sample is visible ahead - it exhibits a greenish discoloration, and small particles are separating themselves from the surface and subsequently disappearing. After roughly fifteen minutes of this accelerated decay, the sample has vanished completely. 02/17/15: SCP-2649 begins waiting near the door to the containment chamber as feeding time approaches, potentially with the aim of breaching containment. Investigation into possible learning behavior on the part of the entity is currently underway. 03/24/15: SCP-2649 has taken to depositing a layer of SCP-2649-A beneath the location its food is usually placed. At this point it is accepted that SCP-2649 exhibits learning behavior, and containment procedures have been modified to include a randomized feeding schedule. 04/10/15: SCP-2649 appears to have discovered that its containment cell is composed of cinder blocks that can be transported by SCP-2649-A. The entity had managed to remove four of them by the time the attempted breach was noticed, and SCP-2649 was transferred to a new containment chamber, lined with ceramic tile. 06/01/15: One member of D-Class personnel assigned to SCP-2649 entered the entity's containment chamber for routine feeding, and immediately fell through the surface of a pool of SCP-2649-A that had been left at the entrance. In the brief span of time in which the chamber door remained open, SCP-2649 was able to breach containment, but was recaptured quickly and with no further casualties. Containment procedures have been revised to include ceramic soles on employed footwear, in order to prevent future incidents of this type. Some site staff have expressed concerns that this was a deliberate attack on the part of SCP-2649, and research is pending regarding whether or not the entity is intelligent enough to coordinate a strategy in this way.